DSynchronize lets you copy, move, or synchronize folders on your computer or over a network. The program can sync in both directions, making both folders up-to-date with the latest data, do realtime sync where any changes copied to destination and even verify it's transfers. 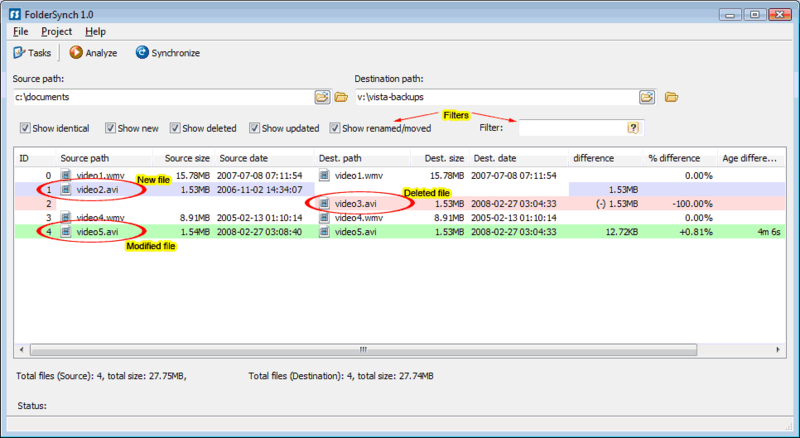 The program can schedule operations, add timestamps to the destination folder and keep multiple backups (iterations). NOTE: By default the program does not send deleted files to the Recycle Bin, but are instead deleted outright. Use caution in initial sync tests with sensitive data. How to extract: Download the ZIP package and extract to a folder of your choice. Launch DSynchronize.exe. Maybe I misunderstood "synchronize"? If I have a and a , I want the destination folder/tree to mirror the source. This doesn't do that. I thought I'd use this to maintain a second copy of my digital music collection, but when I did a bunch of tagging and renaming, and use this, the destination files were not renamed. I don't expect a utility to detect if the content has changed -- I just wanted (and want going forward) my "backup" to be exactly like the original -- with extra files and folders gone, and new ones copied. This requires a "utility" because much of the change to the source involves cleaning up filenames, so drag-n-drop produces two (or more) "copies" of the same songs in the backup. None of the others were changed. All I tried was copy one tiny folder to another. Is there anything I can do ? Or just use UNDELETE software.. If you don't select "Use Recycle Bin" the program deletes directly files. DSynchronize is designed for Power Users, if you select some options without know their effect, can produce big damages. DSynchronize has been downloaded 66335 times on last two months. You are the only user that have reported these problems, so I think that the cause of these troubles it's an configuration error not a program error. 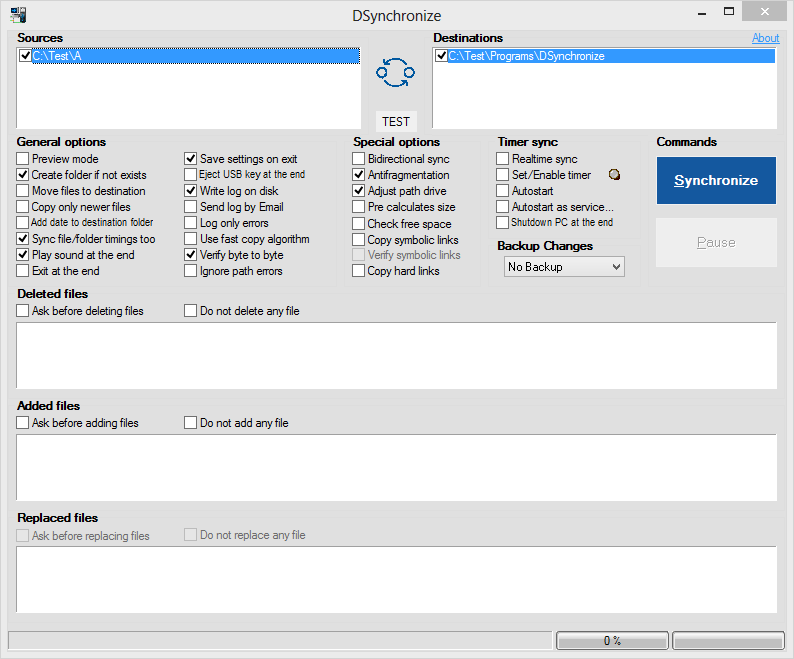 Sinchu: Emphasizing that I've used Dsyncronize for years and it's definitely my go-to sync program, I acknowledge any program that deletes files should probably send them by default to the recycle bin. I've added something to the entry. 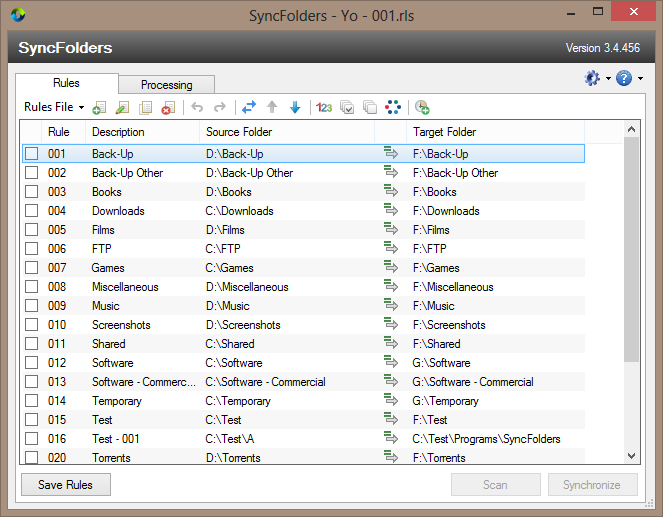 SyncFolders supports 3 synchronization modes - Copy, Backup (Mirror) and Two-Way Synchronization on an unlimited number of files and folders. Other features include preview, file comparison by date and size or by content, integration with Windows task scheduler, filters, connections from or to UNC paths, multiple rules in a single rules file, and deleted or overwritten files can be moved to the recycle bin or to a time-stamped history folder. It even can ignore one-hour time stamp differences caused by DST switch for synchronization to FAT file systems. The program includes logging, command-line parameters and more. SyncFolders is multilingual and comes with a detailed help file. Stealth: ? No. Creates an empty folder in AppData. How to extract: Download the "portable version" ZIP package and extract to a folder of your choice. Launch SyncFolders.exe. Optionally you can delete unnecessary language files. SyncFolders stops working if the image list from Windows cannot be created.